This is a brand new page, which I hope will be filling up with your anecdotes, memories, reviews and comments about meeting, seeing or hearing Adge Cutler. Please send me your Adge Cutler stories! I knew Adge and his wife. I used to have the Severn Salmon pub in Severn Beach and he played there for me one evening in the early 70's. Adge said it was one of his best gigs and the only time he did an encore. He brought the house down, the dance floor was full and so were the grounds of the pub. It was tragic when he died not long after. I have several of his records that he signed for me after the gig. I am now a Bristol City season ticket holder of long standing. However, in 1967, I was an eleven year old schoolboy and the second City match I ever saw was the FA Cup 4th Round tie against Southampton at Ashton Gate. The date was Saturday 18th February. The crowd was 38,017 and Bristol City won 1–0 (Johnny Quigley passed to Terry Bush, who scored at the old open end – where the Atyeo Stand now resides). Equally memorable and important, was the fact that Adge Cutler & The Wurzels played on the pitch at half-time. Adge Cutler was apart of my childhood. I have aways had Adge Cutler's music around me and now it is played by my 10-year-old daughter. 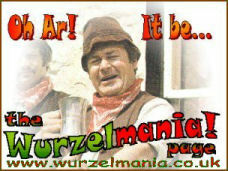 I am now taking her to see The Wurzels when they are in our town. Memories fade as we get older but the name Jacko has never faded and I still get called it on and off! I can remember the London-to-Brighton Vintage Car Run - all of us in the old coach. It was a good day out. Looking through my LPs with Adge on the front cover nudges the memories and my daughter playing her CDs just shows that it doesn't matter how daft an idea, some times it last. I spoke to former Wurzel Melt Kingston, and he recounted two tales about his arrival in Bristol to join the band. Melt Kingston was invited to join Adge Cutler & The Wurzels in the later summer of 1967, when his friend and fellow tuba player Henry Davis left to join the New Vaudeville Band. Melt described arriving at Bristol Temple Meads station from London to be met by Adge, who drove him to his house in Nailsea. Previously Melt had been part of the London jazz scene and was a tuba player of some renown in those circles. The string bass though, an instrument he would be asked to play with the band, was not something he had tried before although he admitted to "knowing the fundamentals". So he and Adge settled down in Adge's lounge armed with Henry's spare string bass and liberally refreshed by glasses of cider from the barrel of scrumpy in Adge's parlour. Sadly Melt's memories become rather hazy from then on, but he reckons he learnt two songs before the cider took over. Time wasn't on their side either because that evening Adge had to go to the press launch of an advertising campaign for Mr Brain's Faggots for which Adge had written the song Faggots Is The Stuff. Melt went along with him to be introduced to the press - and presumably the rest of the band. More drink was consumed and the next day Melt woke up with a terrible hangover and vague memories of two Wurzels songs. Thus armed he made his debut with the band that evening! He has another tale about Adge taking him down to Dunne's Menswear in Bristol to get kitted out in his Wurzels gear. In those days there was no such thing a charity shops, so it was to the high street that they went for checked shirts, neckerchiefs and a suitable hat. Melt was paraded in front of Adge in his new gear. Adge looked quizzical, took the nice new hat from Melt's head, threw it on the floor, jumped on it a couple of times and replaced it on Melt's head. 'That's better! ', he announced. Pictured is a 1937 Bedford WTB with 25 seat coachwork by Duple; reg JT 8077. JT was new to South Dorset Coaches at Corfe Castle in Dorset, and stayed with the company for thirty years before passing to Adge Cutler of The Wurzels fame. 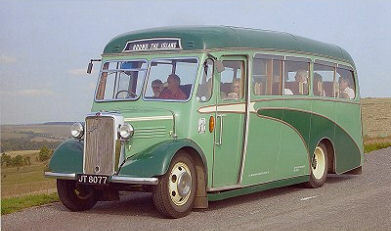 Adge used her for band transport, but he was also interested in vintage vehicles, and took her to a number of rallies, including the London to Brighton Historic Commercial vehicle Run. Following Adge's untimely death in a road accident, she passed to new owners in Gloucestershire in the mid 1970s. She became semi derelict before passing to Pearce, Darch & Willcox, at Cattistock, in Dorset who restored her, and recertified her as a PSV in 1987. After two or three years the company and its modern coaches sold out to Southern National, but JT 8077 remained in the old garage until 1992 when acquired by John Woodhams Vintage Tours in Ryde, Isle of Wight where she was added to their fleet. Very few WTBs survive today, an JT 8077 has been carefully restored and maintained to present day standards, and is the only example in passenger service. Looking at the website, JT 8077 is available for hire for weddings or other special occasions - seems more tasteful than a stretched limo! A couple of years ago I was chatting to Pete Budd after a Taunton gig (when most people had retired home!) about a clip of a promotional video of 'The Shepton Mallet Matador' which had been shown in the recent InsideOut West documentary on The Wurzels. Pete told me about about the filming of the 'pop video'. Apparently they started filming very early in the morning, and everyone was there except Adge. A search party was set up and he was eventually found on the outskirts of the town leaning on a five bar gate chatting away to a couple of inquisitive cows! Apparently quite typical of him! I went to a live show by Adge Cutler and The Wurzels sometime in the 1960s, probably '65 or '66. It was at the Gaumont Theatre in Taunton. I would have been 17 or 18 at the time. I remember enjoying the show, but not much more. I have performed a few of the songs myself over the years and still think they are fun, although I am not so keen on the ones that came out after Adge's untimely death. Rob Williams, ex-pat West Countryman; now in Illinois, USA (2007). Thursday 9th August 2007 saw the funeral of George Lefevre of Shirehampton. George was the winner of the South West Cider Drinking Competition where he consumed a massive seventeen and a half pints of scrump on the one hour allotted. An Adge Cutler fan recounted a tale of a gig Adge Cutler And The Wurzels did on a farm in the Coleford area in the late 1960s. The stage was set up in the yard between the barn and in front of the slurry pit. A cider bar was set up and the crowds were soon in the spirit of the performance. As Adge and the band took the stage, it started to rain. Never to be concerned about a bit of rain. Adge and the band played on, and the crowd stayed to watch. As the performance gathered pace, so did the rain; but fuelled by plenty of scrump the audience stomped along with the music. And as the crowd filled up with cider, so the slurry pit filled up with rain - and eventually it burst it's banks, sending a wave of noxious effluent across the yard. My narrator described a scene of devastation through which hundreds of Wurzels fans stuck it out (or indeed got stuck in) as the music played on. Those in wellies happiliy splashing along to the music, everyone else was ankle deep in raw liquid manure - but no-one willing to leave until the show had finished. He claimed that the clothes he wore that night stank for years to come. One wonders if the seeds of the Champion Dung Spreader song arrived to Adge that night! Blame it on the cider!